Coach Blatt and referee Perez were involved in this round’s most weird blooper. 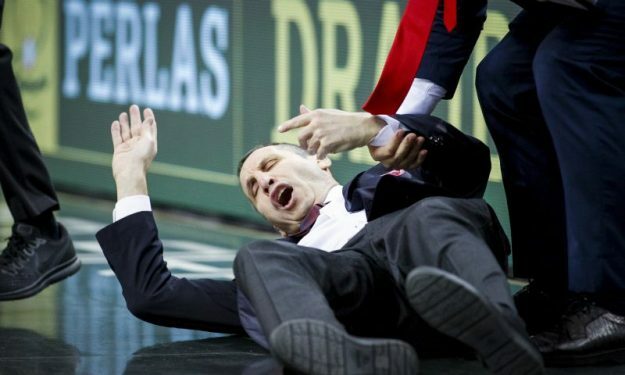 As referee Emilio Perez was running down the court during the game of Zalgiris against Olympiacos, he accidentally stepped on coach David Blatt, as the latter fell on the floor. Perez immediately helped the coach get up and everything seemed to be fine after the little blooper moment. As David Blatt explained in the press conference: “I was not on the court and the ref run into me, of course not on purpose. It was in the wrong place, the wrong time, that’s all. Didn’t feel good at all, though. I have a bunch of steel rods in my back and it doesn’t feel good. Still, I will survive“. Coach Blatt is referring to his back surgery, which was performed at the end of last season.